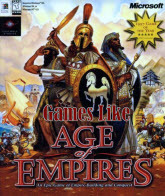 Games Like Age of Empires '+g+"
Age of Empires is a series of real-time strategy computer game developed by Ensemble Studios and published by Microsoft Studios. The games in the series focus on historical events and gives players a choice of 12 civilizations to develop from the Stone Age to the Iron Age. If you are a fan of real-time strategy games like Age of Empires then find the recommendations for it below. Age of Mythology is a spin-off from the Age of Empires series and the gameplay is based on defeating enemy units and towns, building your own units and towns, training villagers and fighters. In this way, players advance their tribe through several ages. Empire Earth series is another historical real-time strategy game like Age of Empires. Empire Earth spans 500,000 years of world history, which is divided into 14 epochs, beginning with the prehistoric age, and ending with the nano age. The game itself contains many unique and innovative features like morale system that impacts individual unit statistics and a hero system that lets you create heroes at the town center or capital. Rome: Total War is a PC strategy game developed by The Creative Assembly and released by Activision. The game's main campaign is set during the rule of the late Roman Republic and early Roman Empire where the player takes a role as the head of one of the three great Roman houses; the Julii, Brutii, and Scipii. Each of these factions have a different set of attributes, initial objectives, and a few initial provinces under control with ultimate goal of becoming an emperor. Rise of Nations is a real-time strategy computer game, developed by Big Huge Games and published by Microsoft. Rise of Nations employs the concept of "territory" in the gameplay and focuses heavily on creating a balance between offense, defense, and the nation's economy based in the city. StarCraft 2 is a military science fiction real-time strategy video game developed and released by Blizzard Entertainment. The game revolves around three species the Terrain (humans exiles from Earth), the Zerg (a ruthless biological alien race) and the Protoss (an advanced alien race with vast mental powers). With over three million copies sold worldwide in the first month , StarCraft II became the fastest selling real-time strategy game of all time. Company of Heroes,....if you can think of more, then don't forget to mention it in comments.